How do I view course files as an instructor? Course files include any content uploaded to your course. 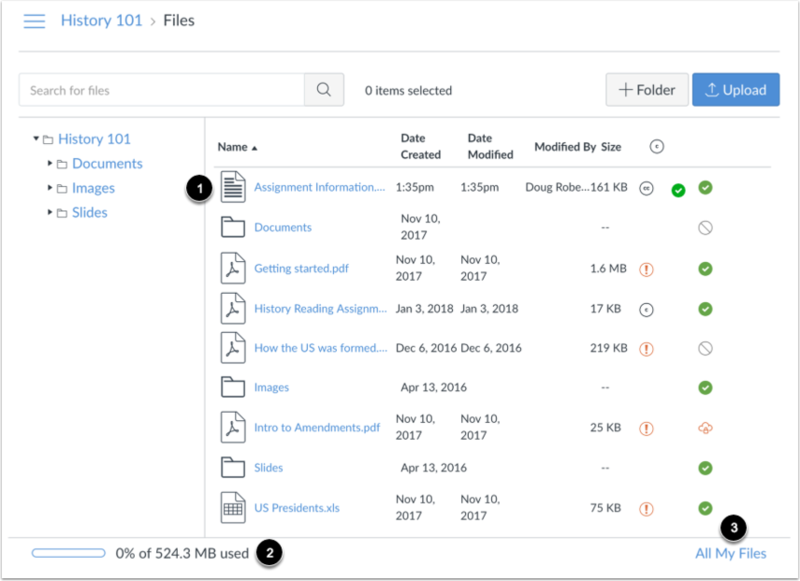 By default, each course has 500 MB of storage space in Canvas (Free-for-Teacher accounts are limited to 250 MB). Administrators can change the quota for the entire institution or on a course-by-course basis. Files uploaded to your course will not count towards your personal file quota. If the Course Files link is shown in the Course Navigation menu, course files can be viewed by any user in the course. Learn how to manage Course Navigation links. Note: When using the Rich Content Editor in a course, you cannot access files from your user files. To add files to a course, the file must reside in the files for the course. However, you can embed images from your user files using the Rich Content Editor. All published course files can be viewed by all course users . However, some files may restrict access to specific users. You can view your user quota and what percentage of that quota has been used . Learn how to manage course files. If you want to see the files for all your courses, click the All My Files link . 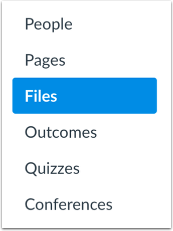 Canvas displays your User Files page with all course folders displayed below your user files. Previous Topic:How do I view my user files as an instructor? Next Topic:How do I view group files as an instructor? Table of Contents > Files > How do I view course files as an instructor? Re: Not sure why it will not allow me to save a file to a page when I have done it a hundred times before the same way?